We had a not so lazy Sunday here in our little eco-tourism town with two trips. 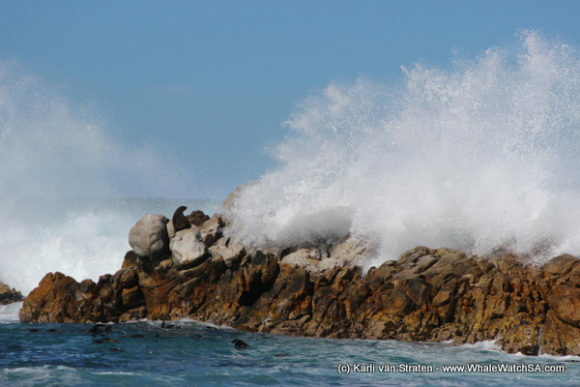 We got to launch a little later today, due to a little bit of swell in the morning. We also had some wind out there but it was just enough to get our lips a little salty. 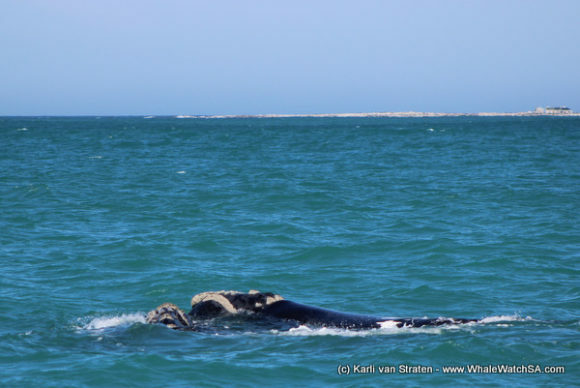 The first trip set off around 11:30 and managed to find a couple of Southern Rights a few hundred metres away from Jouberts Dam, where we do most of our shark cage diving. 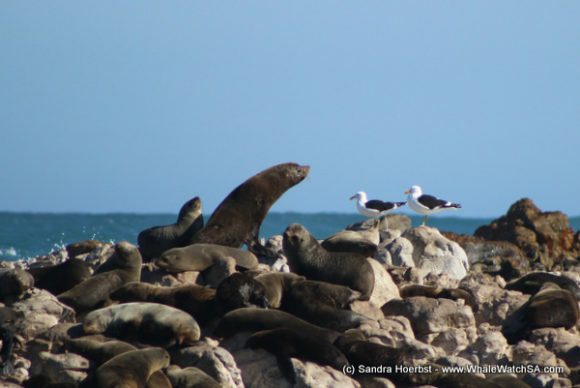 At first, we had the two Southern Rights that we had found off Danger point yesterday. 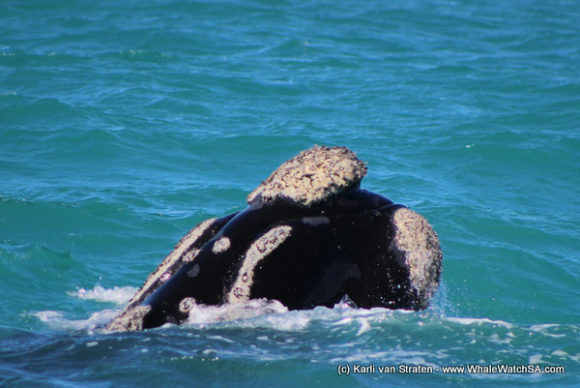 These animals were easily identifiable by the one individual’s striking white marks, which covered a large proportion of the left hand side of the whale’s body. 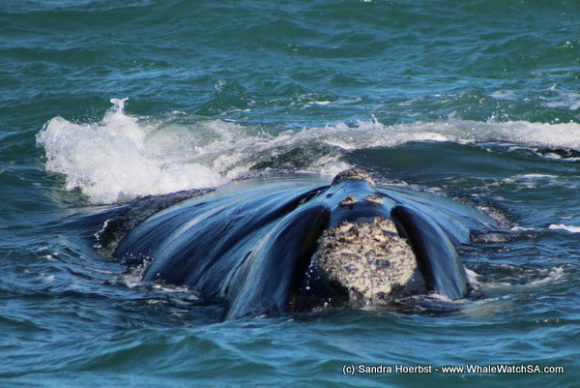 Today, however, the whales were a lot more relaxed and we got to get a good couple of views before they were joined by a third whale, which seemed to pop up out of nowhere. 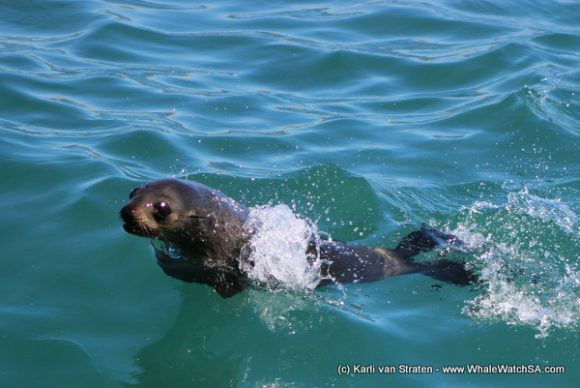 After the arrival of this sneaky cetacean, things got fun when they started to exhibit some typical mating behaviour. Tails and flippers were coming out the water at all angles and we had some really spectacular sights, which included one whale resting its tail on the head of another. Following this awesome sighting, we made our way past Dyer Island towards the world famous shark alley. 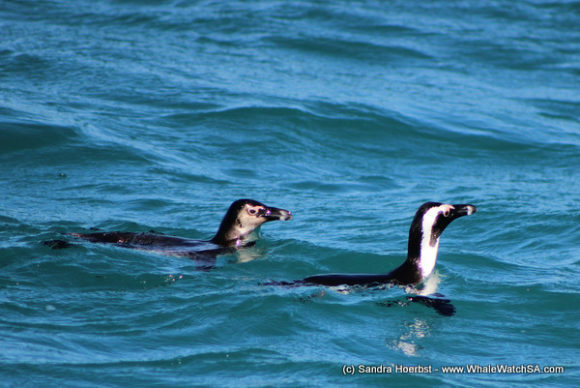 Whilst en route, we found the smallest member of the Marine Big 5, a little African Penguin. Weighing in at a meagre 3kg, these flightless birds are one of the more threatened residents in our bay, with overfishing wreaking havoc in an already fragile population. 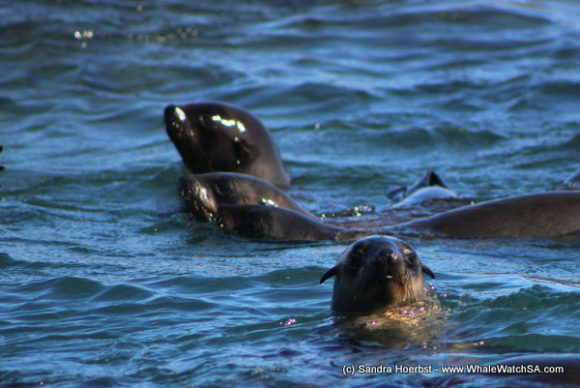 Our stop at the seals included many playful pinnepeds, who were going crazy in the water. 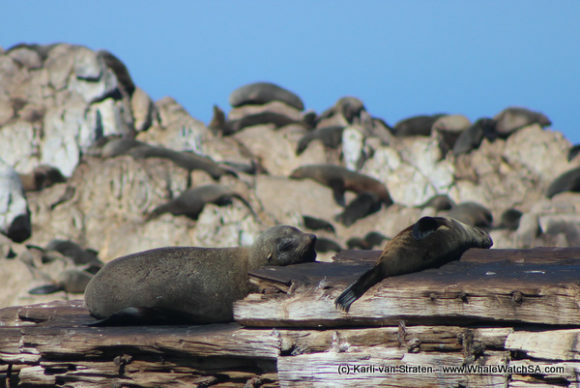 Cape fur Seals, like all marine mammals, love to play and this is not without purpose. Whilst porpoising and propelling themselves out the water for recreational purposes, they are learning vital skills to avoid being caught by one of the world’s most notorious predators, the Great White Shark. The second trip also got to see 3 of the Marine Big 5, with a stunning mating group of Southern Rights being the highlight of the trip. 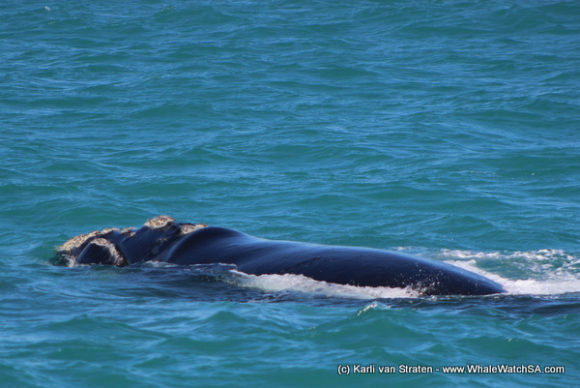 We found the group just offshore of Pearly Beach and we had at least 5 majestic giants cavorting round the boat. 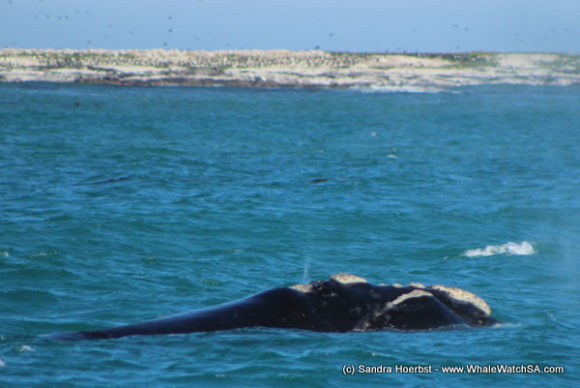 These mating groups always seem to give the animals a little more confidence, with the whales approaching us numerous times. We also got to see one of these gorgeous guys open it’s mouth, which is pretty rare since they don’t do too much feeding in our waters. In terms of other cool sights, the last trip also got to see a Short tailed Stingray at Slashfin. 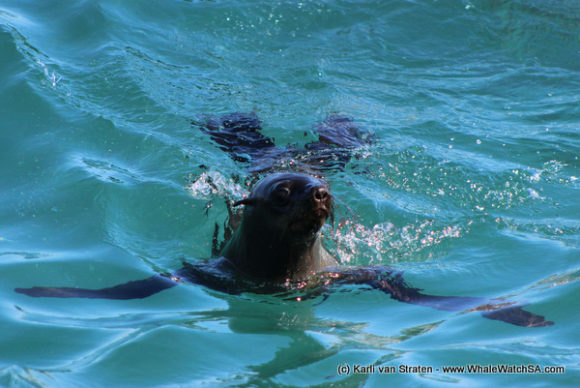 Although these large rays are usually feeding at the bottom of the bay on things such as fish, squids and the sorts of creatures who live in or protect themselves with shells, sometimes we do see them up at the boats, particularly when the water is warming up.